Hello, My name is Raging_lunatic I run a Twitch stream on Twitch and Mixer. I am a gamer mostly survival Type games been on ADK's H1z1 Whitelist for about 9 months. Have a few friends in your ranks. I am applying for membership and hope to see you all in H1Z1, ARK (have my own Server there, Elite Dangerous, Star Citizen and many more. So hello and putting in app now. Herro! My name is a Vice i are looking nice people to play Game with I mostly Overwatch playa around 3500 sr. I lika da Tech and are looking for job as Programmah. But much free time rn. Happah New Yeah! Hello people, my name is Fernando, I'm 27 years old and play H1Z1 to 9 months. Hello, I am Arrow I'm from Brazil and I'm 16 years old. I love to play H1Z1 Just Survive and H1Z1 King of Kill. CasperDaGhost is here. Hi all i guess. Dear ADK Members who is reading this. Hello my name is Casper, Yes my name is really Casper. Not the Casper the friendly ghost, I get that joke a lot, and it still makes me chuckle. I am a art major student that loves to draw of course. Lately i been making charcoal drawings for a huge project. Besides drawing I also make costumes and crazy makeup designs for horror shows or movies. Besides what i do away from the computer, I love to play video games, and i mean i love it..... I love all my games, its hard for me to choose what i love. I can't single one out, so i have not favorites. Right this moment i been playing lots of Bf4 and sims 3. If ya got questions, ask away i wont bite maybe. Sincerely, Casper the friendly ghost. Hi! :D I am BlackMaze66 (Lecap). I am just an average Dutch guy that likes to play games. |B) I play Battlefield 4 and CS:GO (I used to play PS2 few years ago with ADK). I'm Wormy, I'm a young gaming enthusiast. I mostly play League of Legends, but I'm open to any games. I recently purchased H1Z1, and it's been a blast playing. I hope to meet lots of new people and makes lots of friends! Dear ADK community, My name is Gloomy, I am 20 year old male. Sorry I'm A super shy person, but thats why im here in the first place. I like to make new friends because i dont have many of them, also i like gaming so thats a plus. I always been shy, but hope i can open up to make new Pals but it might takes some time for new comers that are talking to me. My true goal is to be really open and show people who I truely am, but its hard for me. I also love to game or course, but if you asked me what type of games i like or what game do you like the most. It would be a hard question to answer for me. I love all my games I buy, but for right this moment i love to play wildstar, bf4 at times, and little bit of planetside 2. Besides games I really like to fish because i feel like im at peace when I hear the frogs rawr out and also hear the crickets make their music, and also catch some fish in the process i hope. Also love to watch movies late at night, like comedy movies to really romantic movies as well. I'm not much of a scray movie person, most of them bore me to death and some rare ones that come out scare me to death. Also i'm a goth, if that helps you remember me. I always enjoyed the dark side of things in life. Yeah as a goth i wear makeup to freaky glothes to some, but it does not show who i truely am. Also i really love to draw, like cartoon style of art, but little dark look to it tho. other then that I can't think what ales to say about myself, if you got questions, shoot me some. Well thanks for reading my post and hope i can make my goal happen! sincerely, Gloomy. Hello ADK gaming community! Let me tell you a little about myself, my name is Max and I am 15 years old. I found ADK on battlefield 3 on the 24/7 metro server (rip), it was my favorite server to play on because of the awesome people that played on it. 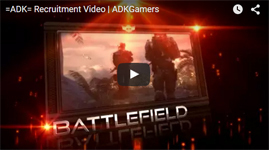 Now I have moved onto battlefield 4 where I still frequent ADK servers (look out for me, im brobang). I am looking to make some new friends that also like to play battlefield 3 or 4. Also I will have plenty of time this summer to make new friends and play games because I am having a surgery so I will be out for about a month. During that month and after I hope to meet a bunch of new friends, that is why I am here after all. I look forward to making some new friends in the coming months. Thanks for reading, see you in battle! Hi I have loved elite since I played it on the spectrum many years ago.. I live in the UK and I'm 52. married with two kids. I enjoy reading fantasy books that's the sword and sorcery kind. I'm looking forward to playing with other players, at the moment I'm bounty hunting. Hi all, New to the forums here but a long time League playser, since season 1. I have a crap load of champions, as I'm sure we all do, but I tend lately to stick to the same ones. Morgana, my fav, I play her tanky ap caster mid. I can often not die at all in a game with her and carry. Mundo, one of my top 3 favs, love hitting cleavers all day long, play him top or support. Mord, ap caster, top Cho ap caster top Amumu, jg naut, jg Azir, mid Zed, mid I used to be heavy support Soraka, Sona, Thresh, and Nami. But I lost my love for that role as I kept running into so many inexperienced adc that would think having healer like soraka and sona would mean they could get hit for free. Hope to catch you all online, my ingame name is UmaOgoto. I've not had a good year, lol, stuck in elo hell in solo queue.